These pictures were taken with a Nikon Coolpix 900 digital camera. I initially posted these pictures at their full 640 x 480 pixel resolution, but they were just too damn big. They took forever to load and they drove NetScape nuts trying to display them all at once. I have since used GraphicConverter to reduce them by 50% to 320 by 240 pixels and also to increase the jpeg compression to the point that I really started to lose picture quality. The pictures aren't as nice now, but at least they are displayable. 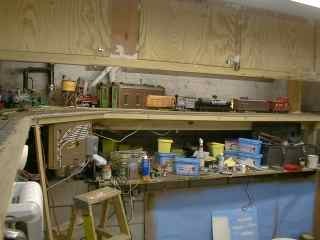 This is a view looking back toward the yard in the opposite corner of the room. The stairway is behind the angled wall at the right side of the photo. Looking back to where the previous photo was taken. Geologically Improbable Mountain is on the right. 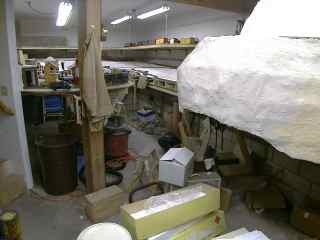 Looking from the base of the stairs to the outside doorway. A hinged bridge is currently blocking the door. 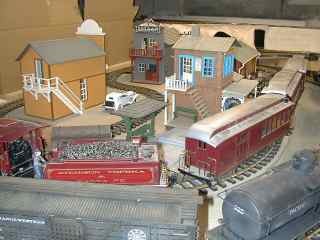 This view of the town shows the passenger and freight stations. The cardbox to the right is a placeholder that will eventually be a block of building fronts. 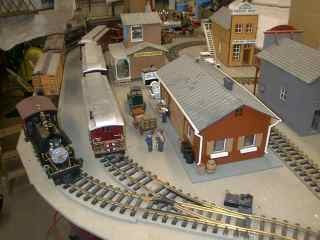 The whole assembly lifts out to allow access to the back of the town. This is a view of the town from the other end of town. Another view of the town from a higher angle. 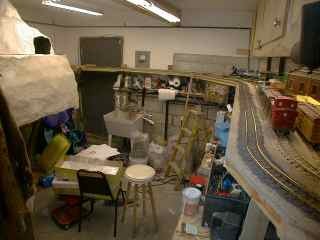 This overhead view shows the main and upper control panels in the background. 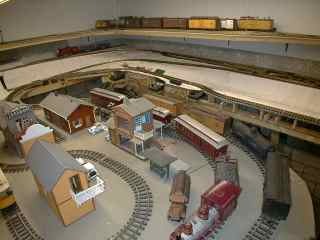 This is the main yard from the end nearest the stairwell. There are 6 stubs each capable of holding just 4 cars. 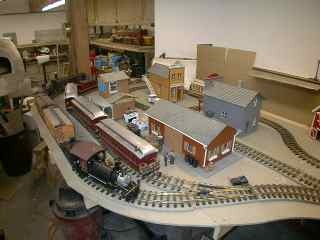 A small engine yard is in the background. 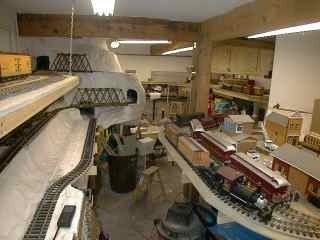 This view was taken from the hinged bridge looking back at the yard and underneath is the disaster that I call a workbench. The stairwell is just off the right of the photo. 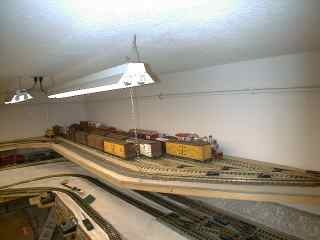 This view shows the upper level yard. 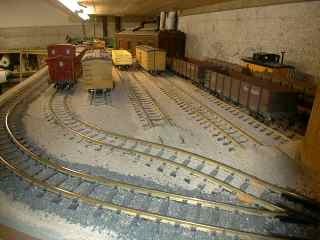 There are only 4 tracks, but each is longer, with 6 to 8 car capacity.